Best practice logistics solutions in the chemical and petrochemical industries have been TALKE’s area of expertise since its establishment in 1947. Safety, quality and customer-oriented service have been an integral part of our corporate culture since day one. Our success proves this is a winning strategy. A family business, we are now one of the world’s leading logistics service providers for the chemical and the petrochemical industries. In Europe, the Middle East, India, China and the USA we have positioned ourselves as an integrated service partner for modern outsourcing and contract logistics solutions. Every one of our more than 4,000 employees is dedicated to ensuring the highest possible levels of quality and safety. They do this out of conviction and as a matter of tradition. Our specialists in transport, logistics and logistic solutions cooperate closely with each other to develop customised logistics concepts to ensure your company’s success. 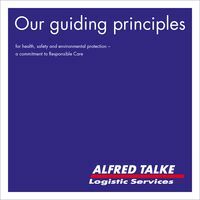 In our company policy statement, we explain TALKE’s current position on the three areas of Quality and Safety, Environmental Safety and Climate Protection, and Social Responsibility, as well as our expectations for the company, our services and suppliers.